Angie Banicki, a tarot reader, intuitive, and Horoscope.com’s newest columnist shares what’s going on cosmically this week—and how to make the most of it. For best results, read Angie’s words as you follow along with her Spotify picks—links to songs appear, and changing it up and listening as you read can help you truly tune into her advice. How many times are you being reminded to connect to your inner child? Live in the here and now and be more childlike. Look at life through the eye’s of a child. I always heard that and thought, yeah I get it, be more playful. I try but life is full of, well, life stuff. Have fun. Easier said than done. More recently, I have seen a different side to those statements displayed by my greatest teacher, my baby daughter Charlotte. She is a saint hidden in the body of a baby. Babies come out so pure, so connected to soul. She’s helping change my perception. How can you show us the way baby? Here are 4 ways she might help you! 1. Wake up with a smile and a twinkle in your eye! What if we all tried this? Turned to our partner in the morning with a silly grin and sparkle in our eye. I wonder might they return the same look back to us? Or maybe they’d look at us like we were crazy and then we’d just laugh and smile bigger! Charlotte’s new thing is to wave at everyone. We walk into a restaurant and Charlotte needs to address every table with her little princess wave, staring each person down – forcing them to look into her eyes. She stares from her soul as if connecting with each human is her job. We could be complaining about our food at the restaurant and Charlotte is demanding the attention of the waiter – waving and smiling. The person could be angry, happy, drunk, or shy – she doesn’t care. She just cares about the connection at that wave—showing you she sees you. Can you imagine if we all had such a desire? Try it tomorrow. Fine, you don’t have to wave at every person on the street. But what about making eye contact. Sharing a smile or hello once in a while. You’d be surprised at how often you get a smile or kind words in response. Because of Charlotte, I’ve found myself learning so much more about people because she creates the comfort zone for them to open up and that opens me up more. 3. The spirit of nature! And in the way that Charlotte truly sees people. She sees the same in nature. Yes, she waves at trees. I couldn’t figure it out the first time it happened. Sitting on the beach in Mexico, she was waving up behind me. I turned – no-one was there. She stared with a smile and the wind picked up. The palm tree returned her wave. The shamans believe trees have more knowledge than we as humans do. They can warn the forest of who is coming. They can read the energy and intentions of people. Whether you believe the Shamans, we cannot deny that nature is a powerful force. Why not try and keep it on our side? And I won’t lie, after realizing that when Charlotte cried in the night and I’d take her outside to touch the trees, she’d calm down and laugh—I started going outside when my head would throb, take a breath and no lie, the headache would subside. The spirit of nature is no joke. I choose to believe it’s power. 4. Feeling Resistance? Don’t Push. Laugh. My dog, Bettywhite, gets very bothered by Charlotte wanting to touch and pull her. Bettywhite has started growling in responses to Charlotte’s pulling. She’s even barked in her face to try and scare her. Charlotte usually stops, stares and then starts giggling. She fights this resistance with more love, more connection. Next time someone seems to scoff at you or makes you feel unwelcome, try a little giggle and persist. Or if that seems too far out of your wheelhouse, why not replace the anger or hurt you feel, with a laugh? A laugh at how humans, and animals can be so serious. 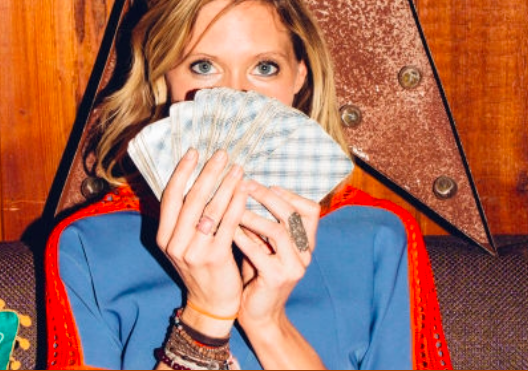 Angie Banicki is a high-profile entertainment publicist turned tarot card reader to the stars. What started as a hobby is now a full time job and lifestyle that is all about living with awareness and intention.Read her January Horoscope.com column here! Want Big, Bright, Beautiful Love? Call in Eclipse Energy!